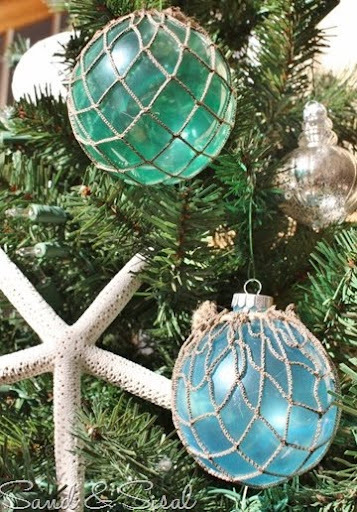 Creative homemade coastal xmas ornaments that will wow you. My golden xmas ornaments, made with wooden cutouts that I bought at Michaels. I painted them metallic gold, same paint I used for my Shell Ornaments and Shell Candle Holders. You can drill holes to attach a ribbon or glue the ribbon to the back. Who doesn't love Fishing Glass Floats. These really turned out great, don't you think. 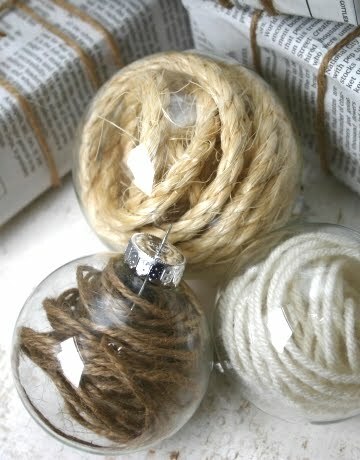 They're painted clear ball ornaments with netting added. To learn the ropes, head over to Sand and Sisal. 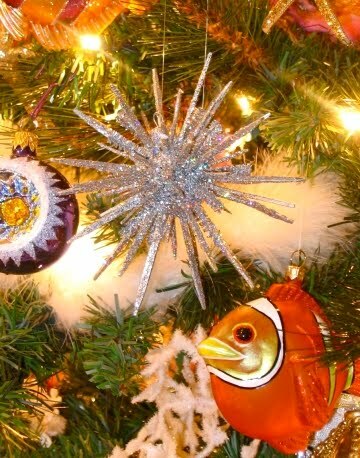 Dive under the sea for these homemade Xmas ornaments -spiky, sparkly sea urchins. The center is a styrofoam ball, and all the spikes are craft sticks and toothpicks. Then a coat of silver paint and lots of glitter is applied. 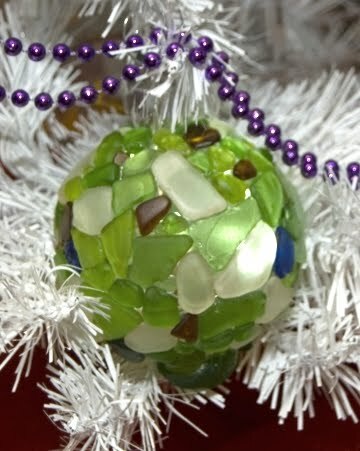 This seaglass Xmas ornament is my favorite from last year's Coastal Living's Editors Ornament Contest. The challenge was to take one plain, glass ball ornament and make it shine. 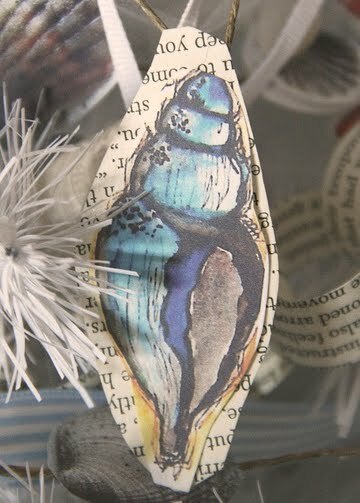 Alisa Burke is an artist and she used shell drawings from her sketchbook to make Paper Ornaments. She also crafted a paper garland, using photos that she took of shells. To see the entire tree, click here -it is all white and looks magical. 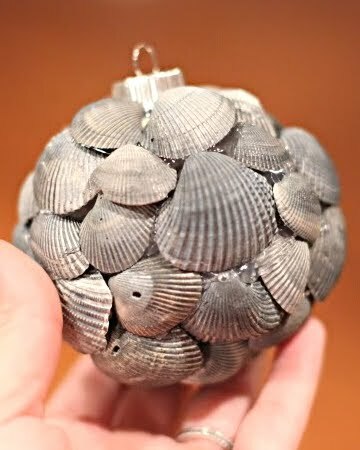 A bunch of shells and a glue gun is all you need to create this handsome ball ornament. Start at the bottom of the ornament and overlap the thin part of the shell. To learn more, click here. 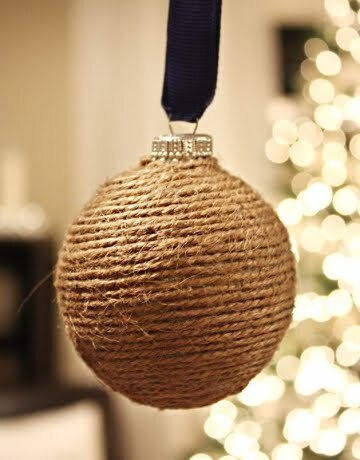 Or give an ornament a Rope Wrap -instant nautical appeal. A wooden cutout was used to make this elegant Crushed Shell Star. All you need to do is drill a small hole before you glue the crushed shells on. The satin ribbon adds festivity. 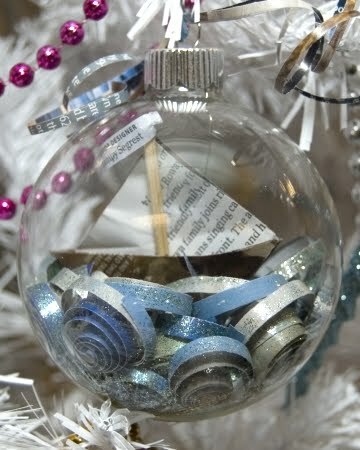 Then there are the oh so popular filled clear ornaments. 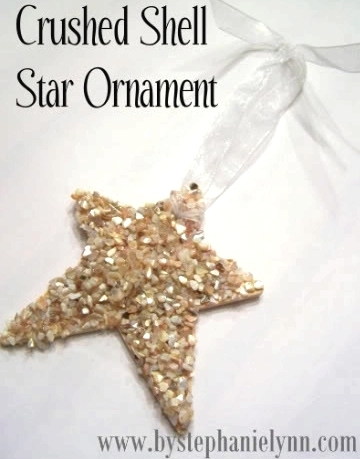 The easiest homemade Xmas ornaments to make! You can find previously featured examples here and here. Here the theme is vacation ornaments. But you can fill the clear balls with pretty much anything. Seen here. A sailboat on a sea of swirls, made of magazine pages. Also from the Coastal Living editor's contest. 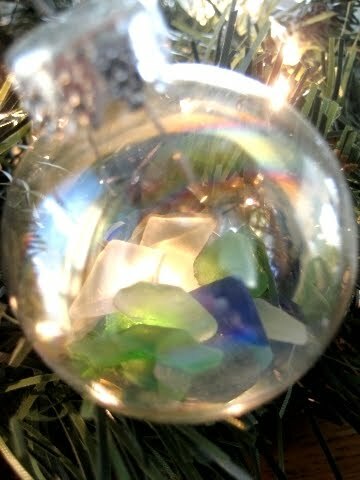 And my seaglass ball ornament. 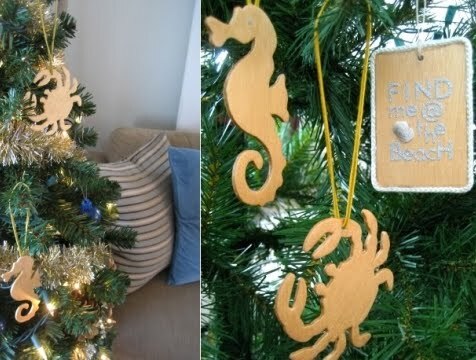 Which of these homemade coastal Xmas ornaments would you want to make?